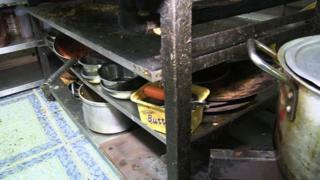 England's filthiest restaurants should be forced by law to display hygiene ratings, inspectors say. Outlets in Wales have had to display food hygiene ratings since 2013, but no such law exists in England. Inspectors say this results in premises that score lower than three out of five - meaning they must improve hygiene standards - failing to display ratings. The British Hospitality Association (BHA) said it believed the display of hygiene notices should be voluntary. The BBC's Inside Out team filmed a hygiene inspection in Leicester, where evidence of mouse and rat droppings, dirty dishes and floors and mouldy kitchen surfaces was uncovered. Andrew Wood, from the inspection team, said: "I find it frustrating [that ratings are not displayed]. "Members of the public are not always able to check the ratings online so in a way they are going into these places blind. "It must also be frustrating for businesses that have achieved good ratings." Ratings for food outlets can be checked online. Leicester City Council's food safety team manager, David Barclay Rhodes, said: "At the moment, I can walk along any street in England and see stickers with five, four and three ratings which mean they are satisfactory or better, but I never see the bad ones." Assistant city mayor of Leicester, Susan Waddington, said: "We feel it would be better if it were compulsory for the rating to be displayed on the window quite clearly and inside the restaurant. "That way, customers can make a choice and the people that run the businesses have a motivation to improve where hygiene standards are not high enough." She added: "I think owners would be motivated to push up standards"
The BHA said it believed display of the ratings would soon become mandatory in England. However, it criticised the ratings for a lack of consistency and said it would only support their mandatory display "if an effective and independent appeals process is put into place". The Food Standards Agency said it had started to build the case for the mandatory display of ratings in England. It said it hoped to present its work to the government over the next few months. The Department for Health said it would look at the evidence and would make a decision "in due course". For more on this subject watch Inside Out on BBC One East Midlands at 19:30 GMT on Monday 18 January and nationwide for 30 days thereafter on the iPlayer.